You are currently browsing the category archive for the ‘Turin’ category. One of the perks of a professor’s life is the opportunity to chat up people and to give talks in interesting places. Despite the fact that my wife spent three and a half months teaching at the International University of Torino, the Director was good enough to ask her back when he discovered that she was going to be on the same continent for an extended period. The date that seemed to work the best for the talk happened to be my birthday. I was hoping that we might spend another memorable afternoon at Combal Zero, the restaurant that made my day on the same occasion just three years ago, when I was 64. Check out the post. It was a fine idea, but it was not to be. The restaurant is on the outskirts of the city, and the best time to go is during the day, for a very leisurely lunch, in fact. But talks always entail preparation, and the delivery of my wife’s speech had been scheduled for six to seven PM on January 31. Our flight back to Hamburg was booked for the following morning. 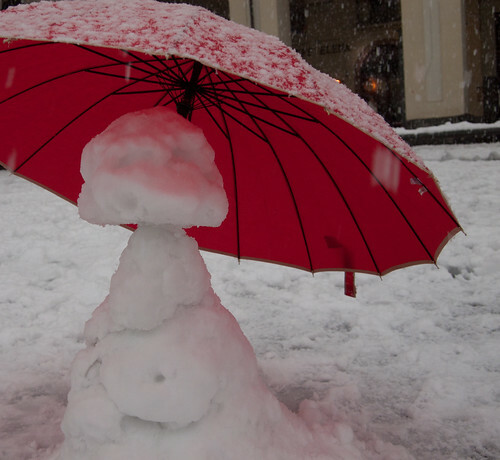 We didn’t know it at time, but the onset of winter weather had just preceded us in Turin. It was cold and white, but most of the residents of the city had been wondering for a couple of months where winter had gone. As we waited for our luggage to appear, ski sack after ski sack came down the carousel. Finally, our bag arrived and we headed in to the center of the familiar city. Our host had arranged accommodation at the Hotel Victoria, which has much to recommend it. It is on a cul-de-sac, for one thing, and it is very close to the center of Turin. 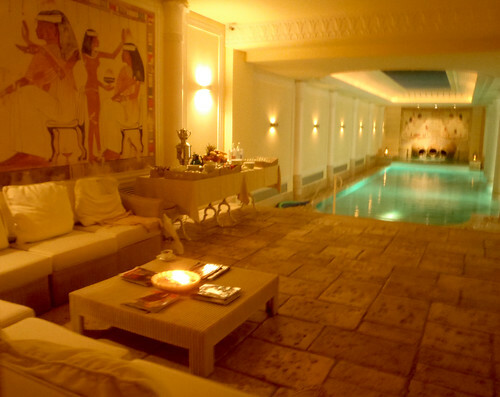 In addition to the lovely decor and the excellent breakfast spread, they have a sybaritic spa influenced by the Egyptian Museum, which is just around the corner. By the time we checked in, unpacked and checked our email, it seemed like ages since our miserable lunch at the Frankfurt airport. Seven o’clock is very early for eating in Italy, but we headed out into the snow and slush to a restaurant that had been recommended by the concierge. We were the first ones there. My wife had been suffering from a pinched nerve since our arrival in Hamburg, and as soon as she sat down to order, everything seem to come to a head. She felt absolutely wretched and could not eat! Not being able to eat in Italy is as close as you can come to an emergency without actually having a stroke or a heart attack. If you show up at the emergency ward of a hospital, you will be admitted immediately. To be sure that this was not something life-threatening, we did just that. Unfortunately, it was a Sunday, so the waiting room was jammed full of people in various states of distress or despair. Losing one’s appetite is not actually considered life-threatening, even in Italy. So we had to wait and wait. An Italian colleague from the C.T.L.S. program in London had invited us over for lunch, but when he heard of the dire situation, he insisted on meeting us at the “Ospedale” and taking on the role of interpreter. In my book, spending Sunday morning in an emergency ward of a hospital on behalf of a colleague is enough to merit guaranteed entrance in Paradiso. All is well that ends with an Italian meal. But a home cooked meal that begins with risotto and ends with a spectacular, delicious tiramasu is worth the price of visit to any hospital. And this particular meal seemed to require four different kinds of wine, not to mention a bottle of Barolo for cooking the main course. That kind of repast is worth braving the torments of the Inferno and Purgatorio to boot. I simply had to abandon my recent conversion to vegetarianism for the afternoon, but it was a small price to pay for the wonderful cooking and the hospitality of Roberto and Maria Elena, as well as the opportunity to meet Giacomo, the new addition to the family. We managed to fit in several more meals before our departure, including an ad hoc “dinner” at a cafe immediately after my wife’s talk. It was good to be in a place that I know, where we have some friends, and where I could speak some of the language and understand more. We have come back to a different city. The Alster has frozen over, and the lake that was full of boats not so very long ago is a huge expanse of white snow. A high pressure has come in, bringing sunshine and cold, clear air. It is beautiful. This blog has been on hiatus for some time now, not because of a lack of things to write about, rather the opposite. Yours truly has been afflicted with the American disease. I’ve been too busy running around to pin down my thoughts with electrons. Our last days before the onset of summer included a road trip to Asheville to see Biltmore, the largest private home in America, a brief visit to Washington DC for a law conference, a flight to Turin, Italy, and an excursion for a couple days into the Alps. Upon our return to North America, we embarked on another trip from Durham to the Nantahala River in Western North Carolina for a few days of canoe instruction at the famous center located in the heart of the Appalachians. Unfortunately, I had picked up a bad cold by this point, and we were not able to complete the course. When we got back to Durham, it was time to pack up and head to Canada. Our house in Nova Scotia was calling. The trip to Turin came completely out of the blue. Faithful readers will remember that we spent nearly four months in Italy last year. This return visit was triggered by a gathering of academics who have taught (or who will teach) at a multi-university institution in London devoted to trans-border legal studies. 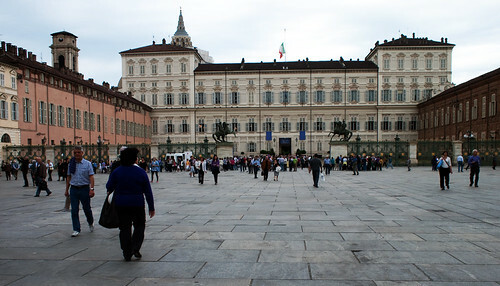 The University of Turin is one of the participants, and they were good enough to host the gathering. 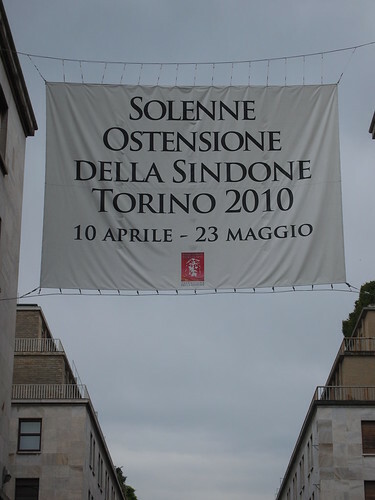 I couldn’t resist tagging along with my wife in order to renew my acquaintance with Torino in late Spring. The old adage about language and physical exercise is absolutely true. If you don’t use it, you lose track of it. I had not kept up my Italian despite the purchase of a CD program to do exactly that. When I visited my wonderful teachers at “Italiano Porticando,” my brain and tongue felt jet lagged. Fortunately, they are generous in their encouragement to anyone who makes at attempt to speak the language. One of them asked me if I had seen La Sindone and I had to admit that I had not yet done so. In deference to their wishes that I make up for my spiritual edification, I hoofed it to the ticketing agency set up nearby. It was 3 o’clock in the afternoon the next to last day of the exhibition. The Shroud is undoubtedly the most famous object in Turin and it has been on display only 18 times in 500 years. My timing could not have been better for Shroud viewing. According the the Catholic Church records, 2.1 million visitors joined the queue for a long wait and brief viewing of the relic. My plane from Frankfurt had been filled with American tourists, which seemed unusual for Turin this early in the season. It was a fine day, so the long shuffle that finally led to a brief communion with the cloth was tedious but not uncomfortable. Our next-to-last station of the cross was a room adjacent to the church of the holy relic that housed a video projector, revealing the latent images fixed in a thin layer that clearly showed what all the fuss is about– a negative image of a head that seemed to be wearing a crown of thorns. Much has been written about the Shroud by believers, skeptics and scientists, and I will not attempt to condense or reproduce the arguments. Suffice it to say the controversy about the cloth will be around for some time. What has me hooked on Italy is the graceful language and the fabulous food. If you are confined to tourist restaurants, it is possible to get a mediocre meal in Italy, and I am sorry to say that we actually did eat one dinner that was less than stellar. On the other hand, a little bit of nosing around can uncover some wonderful cuisine. The standout on this trip was a lunch we enjoyed at four-star resort with a slow food cooking school and a “wine bank” in the countryside south of Turin. Our host from the University of Turin chose this wonderful place to cap a day of touring the Barola wine country. We had a simple, vegetarian meal made up of two dishes, pasta and risotto which was absolutely fabulous. On our last day in Turin, we rented a car and headed south toward the southern Alps. Our destination was a bed and breakfast in a tiny hilltop village near Mondovi– Villa Favolosa. Our hosts hail from the Piedmont region of Italy, but live and work in Chicago during the winter. The home has been in the family for four hundred years. We arrived on Monday, the one day of the week when the restaurants are closed, so I was able to get a cooking lesson from our hosts i and a personal lesson in Italian at the same time. After an excellent breakfast, we headed out by car, venturing into the town of Cuneo on market day, and as far as the historic Staffarda Abbey near the town of Saluzzo. The next day we chose exercise instead, heading into a National Park in the mountains bordering France, an area called Valle Pesio. 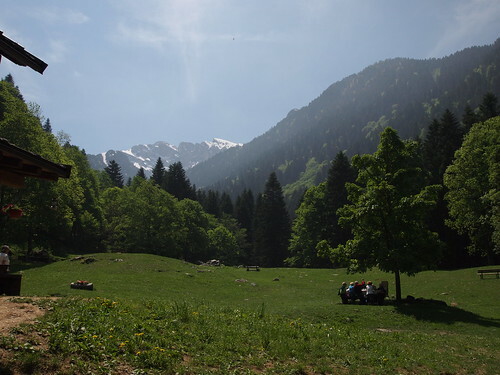 It is home to a major monastery and some steep and spectacular trails. Yet another part of Italy that has branded itself in my mind. I hope we’ll have another excuse to return soon. There is much to explore, too little time. Ciao for now. I have some catching up to do. Check back for additional pictures. 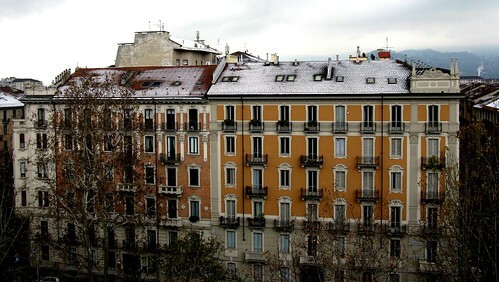 The night before last night the temperature dropped considerably and we woke to snow on the rooftops. The visual signature of snow has been in evidence for some time now in the Alps, but then it dropped in. Literally. We are living at rooftop level. The day before yesterday was mild. We hopped on Tram number 16 with the intention of taking a good long walk up into the foothills on the other side of the Po, or in the park that runs alongside. Before we got there our attention was caught by a market that we hadn’t seen before. It stretches along a street parallel to the Po, a thoroughfare called Madama Cristina. There were a curious assortment of vendors on both sides of the street running for a couple kilometers, perhaps, selling everything from new knickknacks to old clothes, silver to fine linen tablecloths, pots and pans to foodstuffs. My partner came across a wool hat that suited her (which came in handy later on), and I found a place to rent a bicycle for a ride on the next nice day that comes along. Our major purchases were three jars of delicacies that we ended up carrying the rest of the day. Turin is the new gastronomic center of Italy, in case you were thinking of heading for warmer parts of the country. Claudio, the young farmer who helped provision us, has a farm about an hour from the city. Fortunately, he spoke reasonably good English. Otherwise, our exchange would have been quite limited. Our delicacies included: antipasto Peimontese, cogna, and crema di funghi porcini. Cogna is similar to chutney, a sweet paste that goes well with meat and cheese. It has figs, apples, pears, grape must (I’m not sure about that translation) cloves, hazel nuts, walnuts, lemon, and cinnamon. The antipasto is delicious, a specialty of the region made, in this case, from fifteen different ingredients. The cream of mushroom sauce is potent enough to put off all thoughts of winter. Porcini mushrooms, olive oil, tomatoes, celery, and more. Simply delicious on plain toasted bread. Increasingly, this city reminds me of Montreal. There is the same dedication to food, fine clothes, cars and craftsmanship, and a nod to the ever-present obligations of family and Catholicism. Electricity seems to be cheaper than plastic, and I would bet it is for the same reason—massive amounts of hydro power. Hardly anyone bothers to pay for tickets on the old trams and buses that run with amazing regularity throughout the city. Vast areas indoors and outdoor areas are heated with abandon. When I descended into the street from roof level to do my morning shopping, there was no snow in the street, but it was barely above freezing. A sharp wind added a chill to the actual temperature. On my market run everyone I passed was bundled up with hats, mitts and scarves. 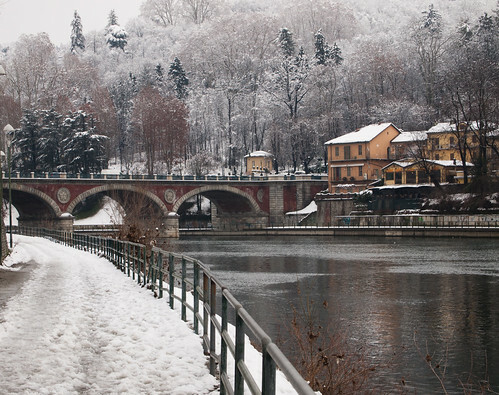 It looks like winter in Torino has settled in for good. Readers in the snow belt of North America may have a hard time picturing the hot, dry summers of Australia, but summer is nearly upon us. Well, it would be if we were actually there. On October 29, my wife and I boarded a flight to Singapore, then another to Munich. Our final destination was the sub Alpine city of Turin, Italy. It will soon be winter here if global warming doesn’t interfere. We must be crazy, right? This adventure began, as most of them do, with a serendipitous meeting several months back. A colleague of my wife suggested that she look into teaching a course at a brand new, private university that was being set up in Turin. The teaching would fit into the semester break at Melbourne. The downside is that, in addition to teaching a new course, my wife will be consumed with marking papers and exams for the next three weeks. For me, it is a wonderful opportunity to learn a little Italian, a language I actually studied for one semester at University some forty years ago simply because I loved the sound of it. When you arrive in a new city it seems like the parameters of your world are very small. You hardly know anyone and there are a limited number of things that occupy your time. Sleeping, eating, and looking for affordable accommodation. This city may be cheap compared to Rome or Paris, but it is certainly expensive compared to Melbourne, especially now that the Australian dollar has taken a beating. One euro is roughly equivalent to two Australian dollars. And everything costs at least what it would in Australia, only in euros. November 1 was All Saints Day, which is an official holiday in this part of the world. Entire families were out walking the streets and most of the stores were closed. Our hotel is not far from Via Roma, which has every luxury shop I have heard of and quite a few I haven’t. The Italians really have nailed that market. It never occurred to me how many of those brand names were Italian until we took a stroll down Via Roma. Both sides of the street are covered with porticoes protecting the wide sidewalks below. It is a wonderful avenue for strolling, a semi-enclosed Fifth Avenue. At one time, Via Roma led to its namesake (as all roads do), but a grand train station was plunked in the way 150 years ago. If you were going to Rome by car you would have to take a slight detour. By train, of course, it is very convenient. Turin is home to most of the factories that produce Fiats. 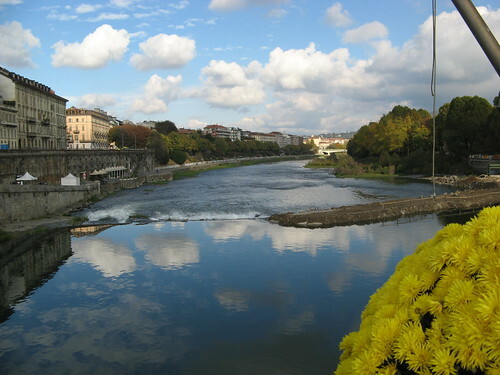 It is an industrial city as well as the administrative center of the region of Piedmont. It is Italy’s fourth largest city, with a population that hovers around a million inhabitants. Renowned for its Baroque and Art Nouveau architecture, its museum of cinema, and its chocolates, Turin indulges its artists like a patron saint. In Piazza San Carlo. a moving photographic exhibit based on Buddhist texts caught my eye. Our stroll took us down to the Piazza Castello, then over to the spectacular Mole Antonelliana. Originally intended as a synagogue, this stunning building quickly became more expensive than its clients felt they could afford. It was eventually taken over by the town council. Begun in 1863, the structure was completed in 1889. Until a high wind broke off 47 meters (154 feet) of the spire in 1953, it was Europe’s highest brick building. More on this later, after I have been inside and seen the Museo del Cinema, a unique, vertical museum. The Mole is a short walk from the Po, the liquid highway that brought the Romans to this site. Our stroll led us, inevitably, to the charming park along its bank, the Parco del Valentino. Stay tuned. There is much, much more to come.